It's Thursday, and you know what that means: Snapshot time! So, what's on the plate for this week's test client? Ready to try this awesome Snapshot out? Download links are below! What goodies have you found in this week's Snapshot? Tell us about it! A new mob variant in the Nether? What could it possibly be! Great, I'll give it a try. To spawn the Wither Boss-You need 4 SoulSand blocks placed in a T formation and you place 3 Wither Skull on the three blocks on the top part of the T.
Charred Skeleton! The world is a better place now! New Wither Boss Picture in the art. 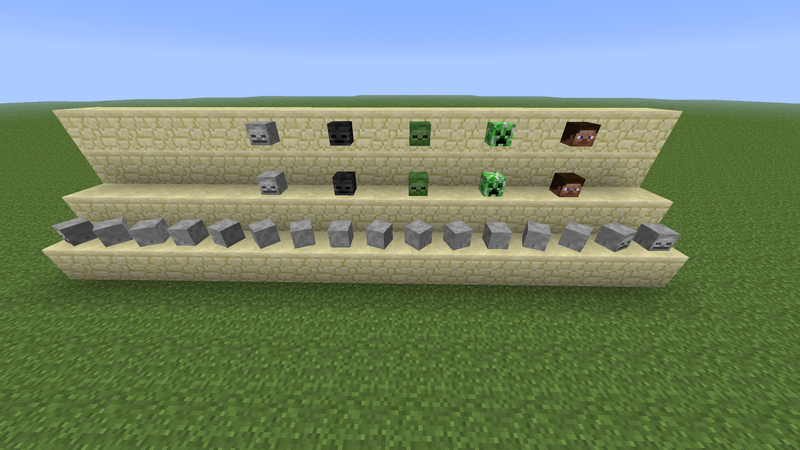 Yay, new snapshot and additions! Gonna test it out! You need 4 SoulSand blocks placed in a T formation and you place 3 Wither Skull on the three blocks on the top part of the T.
Oh... So Withers are just evolved skeletons... in the nether. Good. Just good. Very good. Good. 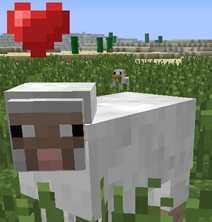 New Nether mob? Hmmm, maybe a normal Wither you can get skulls from to summon the boss. Cool! I'll be sure to bring a powerful enchanted sword to take it down, along with milk to counter the wither poison once I beat the boss. Death animation suggestion: Each side head swells and explodes, then the center head and body swell and explode, dropping a crapton of xp and the beacon core. 'Nuff said. What goodies have I found? Well, take a look at the difference between the mob, and the mob's head. One is a jawbone with a pair of floating eyes, and the other if a faceless green head. I was looking forward to this feature, but it was ruined as the armor layer that is displayed on the humanoid mobs is not displayed on the head item. the command block was never in the creative inventory, because you need to spawn it using commands. 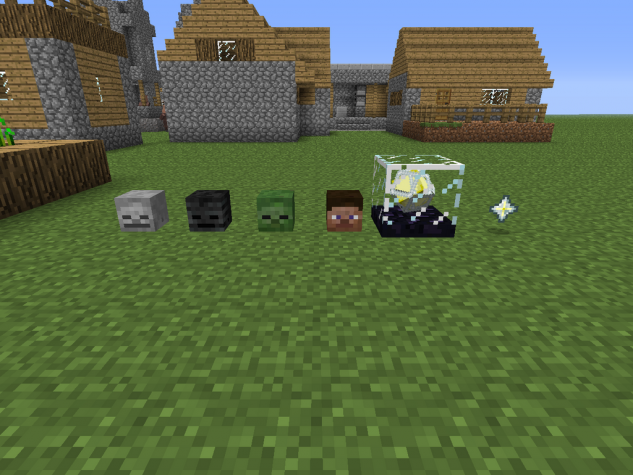 The heads use item icons (which in the default items.png they are faces), not the 3D models to display in the inventory or held by the player. Go to the nether, find "coal" skeletons (yes they do drop coal), get 3 skulls of them, do a T of soulsand (just like an iron golem) then place 3 skulls on top, kill the boss (that I think drops the star I'm not sure) go to the crafting table, place glass in the shape of a helmet, put the star in the middle and the rest 3 spaces put obsidian, and voila you got the beacon. That Beacon-Core thingy will drop from the Wither, right? Well, Wither Skeleton, but okay! It shows a beacon being crafted with 3 obsidian, 5 glass, and 1 nether star. The skeleton head is 398. Not sure about the rest. 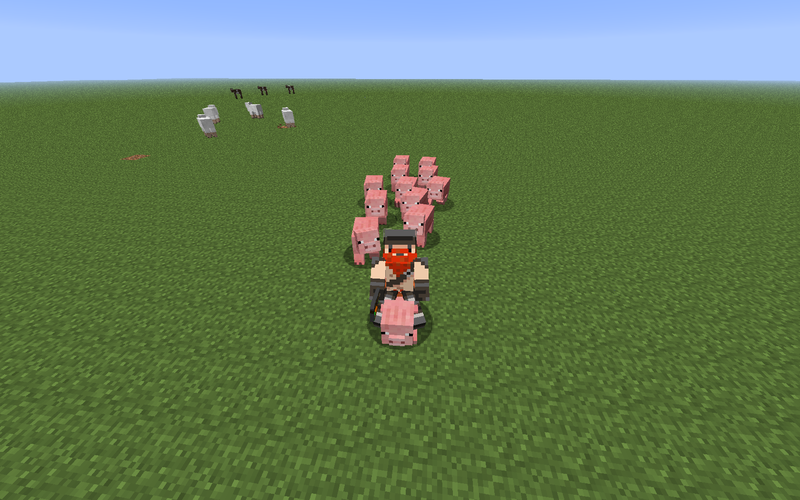 Pigs follow you around with a carrot on a stick. Again not sure about other uses. Well, they follow you around when you have wheat. The carrot on a stick is used for controlling them when you're riding them. Actually, 1.3.1 is the latest stable version. It's not a snapshot, and it hasn't been for over a month. The snapshots are for 1.4.